Having been through toilet training with both my daughters, I have found that it is always good to find a decent book which helps to deal with the subject. ‘I Want My Potty‘ is one such book! It is written and illustrated by Tony Ross, and is part of his Little Princess stories (which are televised on Channel 5’s Milkshake) and certainly deals with the subject in a humorous way. In ‘I Want My Potty‘ we meet the character of the Little Princess, and at the beginning of the book she is just at the stage where she is beginning to think that nappies are rather disgusting – in fact she thinks they are ‘YUUECH!’ The queen tells her that ‘the potty’s the place’ but the Little Princess thinks that this is even worse. So much so that she throws quite a big tantrum, and there is a wonderful picture showing this with the Princess’s face as red as it could possibly be! The queen insists on the potty being the place though, and as we go through the book, we can see that the princess is beginning to learn. She soon decides that the potty is fun and there are some very amusing pictures showing the princess using it for many things other than its main purpose! For example, in one picture she sits on her crown and puts the potty on her head! Another time it looks like she is using it as a chariot! But basically, what we are seeing is that she is starting to come to terms with it and even starting to use it for its proper purpose! Towards the end of the book the little princess is playing at the top of the castle when all of a sudden she realises that she needs her potty…rather urgently! She calls for it at the top of her voice and then there are a whole series of pictures showing the maid, the king, the cook, the gardener and the general all shouting ‘she wants her potty!’ Finally the admiral says that he knows where it is, and it is floating on the water with all his toy boats. The potty is taken very quickly all the way to the top of the castle but, you’ve guessed it…..just a little too late! Both my daughters and I really enjoyed this book and thought that it treated the topic of toilet training with a lot of humour (and you definitely need this when you are going through it!) It is one of those stories which have a really simple text, but it is when you look at the pictures that you gain the whole story, and it is these pictures that provide a lot of talking points. For example, the looks on the little princess’s face in many of the pictures tell so much. Her fury at first when being put on the potty, followed by looks of intense concentration and determination when actually trying to do a wee! The picture at the end when the potty has not quite arrived in time shows a very sheepish looking princess. I do find the illustrations quite interesting, because in most books aimed at toddlers you find that generally the pictures are very cute and sweet. This is definitely not the case with the little princess series. In fact some of the characters depicted are verging on the grotesque, with bulging eyes, long pointed noses and scarlet cheeks. However, they are funny and both my daughters really enjoy looking at them. 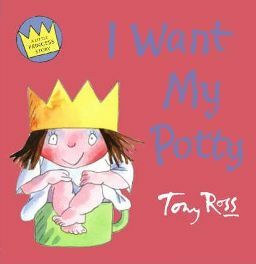 Although I think ‘I Want My Potty’ was a useful book to help my daughter think about going on the potty, and she did find it funny, I don’t think it’s the best book if you want to actually go through the process of using the potty and ultimately going to the toilet. We had other books which certainly did that better. But reading this one alongside some of those others really did seem to help the process! I also quite like the way that the story ends with a little accident, because this helps to then talk about the fact that this doesn’t really matter – and accidents will happen, even to little princesses! My youngest daughter likes to pretend she is the little princess when she goes and sits on her potty these days too! So, overall, I do think ‘I Want My Potty’ is a useful book to look out for when you are starting to embark on potty training, if only for the fact that it will make you all laugh! No Comments on "I Want My Potty"